Peacock removal methods - Perhaps one of the most beautiful birds ever seen in zoos or some other wildlife parks are peacocks, with their colored plumage making up a beautiful display of design and hues. Don’t you know that their tails are the largest part of their bodies making up almost 60% of their entire body mass and size? The colors that you see in most of these birds are green and blue while the eyes as what you call the designs in their tails are mostly made up of gold, red and blue which helps the tail spread out into a colorful array of distinctive feathers. This is actually believed to help them choose a mate in their rituals. The train is spread out on both sides of the bird and forms an arch which looks like a big fan that is wide enough to touch the ground. This is said to be one way of attracting the female population. According to some people females base the selection of their partner with how big their train is, how colorful their plumage is and how radiant the hues are for their male counterparts. 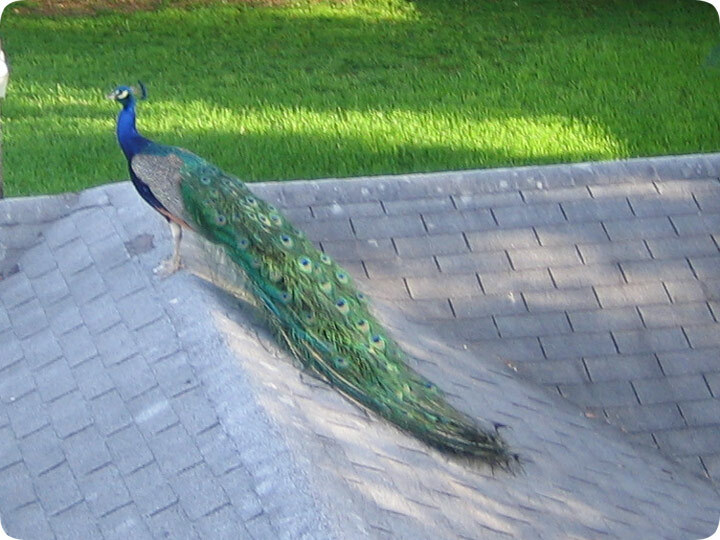 In actuality only the male population of this species of birds are called peacocks, the females are called peahens and the term used to refer to both gender would be peafowl. The male population are said to be allowed to collect a group of females for his mates and each female would be estimated to produce 3 to 5 eggs. They are often seen to be perched on trees. Although these animals are sometimes kept as pets by bird lovers, their presence in some homes may prove to be a little annoying especially when they are creating such loud noises in flocks called parties. One of the most effective ways of removing them is to set up some motion detector or device which is sensitive to any movement and would equally give out either a squirt of cold liquid or something that would just surprise them and would stop them from being too proud. Yes, this species are rather proud birds which often times show off their tails to get attention or to scare off other smaller animals as well. But because birds as they are, they are also afraid of other animals like dogs and perhaps cats so perhaps one way of removing them from your property is letting out that golden retriever of yours or perhaps one of your most annoying cat to chase them away; that is why they are always found roosting in trees or roofs at night to get away from some bigger animals or fiercer animals that could hurt them. Otherwise you can try to trap them by some mechanical machine without hurting these fowls because laws have been established and strictly adhered to in some states to protect them. You can try to lead them away from your property by letting them follow some bird seed trails or crumbs but that may not lead them far enough to start coming to your place again. You can try setting up scarecrows as they have been found effective to ward off some species of birds thinking that there is someone looking over the place, although I haven’t heard of anyone doing that, just the same birds are birds so it might help somehow. Or you can always try to use ultrasonic sound waves to see if it would have an effect on them. Another possible method is to try spraying them with mixtures of any herbs with foul odors. It does have some effects on animals especially those that are territorial. You could also try showing them with shears or scissors to cut off their trains that ought to scare them off, proud as they are I am sure they are afraid to lose some of their colorful feathers. One wise advice maybe to call an experienced company that deals with fowl removal and are aware of some techniques to lure them in cages that way they can be placed in proper sanctuaries away from populous areas where they can live harmoniously and may not create some disturbance and nuisance in the busy lives of those living in the cities.